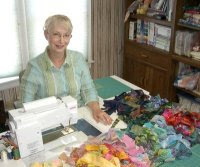 Freezer paper....the quilter's miracle product! Such an great inexpensive product with so many different applications! We are blessed! I use freezer paper for so many things. When I taught quilting classes in Rio de Janeiro several years ago, I asked if they had freezer paper available there. I was told that it was readily available at quilt shops, so I didn't pack any in my suitcases. (I didn't have any room because I was taking a trunk show of quilts along, too.) I soon discovered that yes, there was freezer paper available.....at the equivalent of $3 per yard! Boy, was I in trouble! I was planning to use freezer paper for just about everything from my feathered border class, for applique, and to protect the ironing surfaces from fusibles and paint! When I realized that my class members wouldn't be able to afford to use it and throw it away, I had to quickly change my way of doing things. When I came back to the USA, I bought several 150 foot rolls and shipped them to some of my new friends to share with their guilds in Brazil. It was the least I could do for my wonderful new quilting buddies! One of the things I use freezer paper for extensively is for templates for cutting quilt blocks. I use it when I need a lot of different shaped pieces but only a few pieces from each shape. 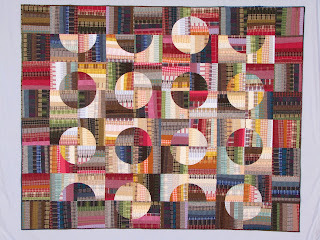 When I made "Kerry's World Piece Quilt" I needed 25 different shaped pieces. I only needed 2 and 2 reversed of each shape. First, I drew a quarter of a large circle on an 18" square piece of freezer paper. Then I drew all the different pieces using string and a pencil to draw nice intersecting arcs. Next, I labeled all the pieces A, B, C, D,.... etc. all the way through to piece Y. Then I stacked my fabrics in sets of 4 like this: light, dark (right side up) light, dark (wrong side up). After adhering each template with a hot, dry iron on 26 separate stacks of fabric, I cut the pieces out with scissors, adding 1/4" seam allowance on all sides. (I used scissors because each template had curved edges.) I laid all the pieces out in the shape of the globe, removing each template as I laid out the pieces. Then all I had to do was sew the pieces together in the proper order. It turned out so beautifully. 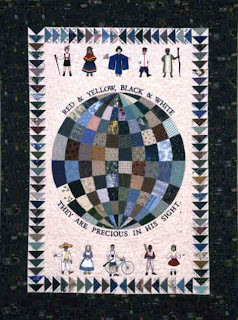 Another freezer paper application I used with Kerry's World Piece Quilt was to draw all the little figures for the top and bottom borders. It was so much fun to dress these little people in native costumes. Then I made the flying geese blocks by using paper-piecing flip-and-sew techniques, with freezer paper serving as the paper foundation.. Leaving the freezer paper on the back of these blocks, I then mailed them all over the world to Kerry's friends in France, Czech Republic, Japan, and Switzerland and family and friends here in the US with instructions to sign their names in the blocks and to mail them back to me. I removed the freezer paper before incorporating them in the memory quilt. (How many freezer paper use am I up to now in this one quilt? 3?) I use freezer paper templates, t oo, when the block pieces are a little odd-shaped and cannot easily be cut with a rotary cutter and ruler. When making Dad's Plaids, I cut several 9" squares of freezer paper, and drew 6" arcs starting in one corner. Then I cut the templates out on the drawn line, and used the them for cutting the block pieces. When using these kinds of templates, you know the pieces will fit together perfectly to make a square, because they were originally cut from a square. Press the templates in place on your fabrics and cut them out, remembering to add 1/4" seam allowances when cutting the pieces out. For Dad's Plaids blocks, I used a rotary cutter and ruler to cut the straight edges, and scissors to cut the curves. Refer to the photos. I used freezer paper templates for the diamonds in my quilt Star Flower that now resides in the National Quilt Museum in Paducah, Kentucky and for my precision piecing class Wall Flower. It makes cutting perfect pieces for intricate blocks childs' play. Try it and let me know how you like this method. 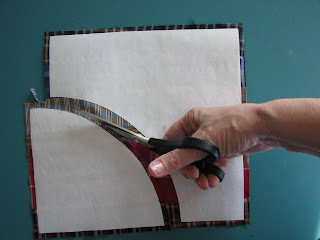 How do you get an accurate 1/4 in seam when cutting by hand,especially when you are cutting a curved seam? Guess I've trained my hand and eye for 1/4" over the years. There are several other ways. You can measure and mark. Lots of different gadgets have been developed to help you with this. One is a washer-looking thing that you roll along the edge with your marking tool in the center. Another thing you can do is develop your original templates, then trace it onto another piece of freezer paper, add the quarter inch seam allowances, and cut the template out WITH the 1/4" seam allowance and use the new template with the 1/4" added to cut your fabric. A trick that I learned from Beth Ferrier is to cut a 1/4" strip of masking tape, or buy the 1/4" tiger tape. Apply a strip of it lengthwise on your left thumbnail if you are right-handed or right hand if you are left-handed and use it to continually check the seam allowance you are adding. 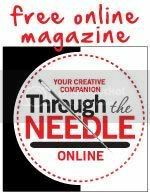 I demonstrated this last tip on my episode of The Quilt Show that aired on March 30. I will try to post photos when I get back from my current teaching trip. Thanks for asking. Dads plaid is so beautiful. I love the idea of adding tape to your nail for 1/4 in seam allowance. Thanks, Joan. Dad's Plaids is a quilt that will be patterned in the new Strings book due out in October. Watch for it! I am enjoying your different techniques for freezer paper. This is so helpful! Makes me want to buy freezer paper by the case and give it as a Christmas gift to my quilter friends!